Posted August 16, 2015 by Heather Michet & filed under DIY, Food, Health Tips, Recipes. Here’s a dream I bet you java lovers have had more than once: An instant cup of joe that has a rich flavor, is very inexpensive and comes from fresh beans instead of a bottle of powder. Is that too much to ask for? Your Fairy Godmother just waved her aromatic wand – decorated with coffee beans – and has granted your wish. Generous being that she is, a few extra cool features were added to your dream come true. Let’s cut to the chase and get the how to on this coffee wish. Cold brew coffee has 70% fewer tannins than hot brewed coffee. The cold water process removes the tannins from the coffee oil, yielding a smoother, less bitter taste. Drinking too much tea or coffee may lead to anemia. Consumption of one cup of tea with a meal has been found to decrease the absorption of non-heme iron in that meal by about 70%. 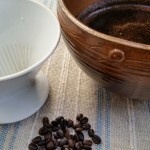 Add coffee to large glass or ceramic bowl. Blend in water until all grounds are incorporated and wet. Cover and let sit at room temperature for 10-12 hours. Place a coffee cone lined with either a gold mesh or paper filter over a glass quart jar. Ladle in liquid from bowl to strain off coffee concentrate from grounds. Repeat until all liquid is transferred from bowl. You may have to discard accumulated grounds from the filter a time or two to allow easy flow-through into the jar. Cover with tight fitting lid and refrigerate until you want a java treat. *You can halve, or even quarter, this recipe with great results. To enjoy a hot cuppa: Add one Tbsp. coffee concentrate to mug and fill with hot water. Adjust the amount of concentrate to your desired taste. Use like an espresso shot over ice and add flavored syrups or milk of choice to create your favorite iced latte! DIY Mocha: add coffee concentrate to hot chocolate. As a baking ingredient, use to flavor biscotti, frostings or other goodies calling for a shot of joe. Just be sure to adjust liquid and dry ingredients to balance if recipe calls for coffee powder. It’s time for a break. Go fix a java libation to reward yourself for creating a tasty, convenient, and versatile commodity. And tip your cup to your Fairy Godmother in thanks.